For those who think that online advertising doesn't work, here's a site - FreeRice.com - that puts banner ads to a good cause. Still need convincing? Watch this video. 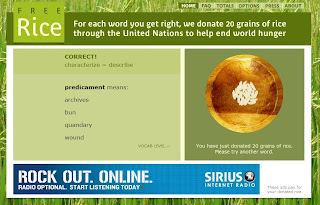 A simple vocabulary game that donates 20 grams of rice to the United Nations World Food Programme for every word definition that you get right. In the first three months, US$213,000 were raised and converted into rice to feed the hungry. As of 26th January 2008, 16 billion grains of rice had been donated. Visit FreeRice to do your bit. This is a sister site to Poverty.com.